I had included Kat as a secondary character in my QUEEN ELIZABETH I MYSTERY SERIES (9 books, still available in paperback from on-line book sites,) but I wondered about the mystery of Kat’s life. And so began years of research to find the real Kat Ashley. She was part of the tumultuous lives not only of Elizabeth Tudor but of her infamous mother, Anne Boleyn. I begin Kat’s story with Anne’s beheading and backtrack to Kat’s early life. As Elizabeth says in the novel, “Anne Boleyn gave me life, but Kat Ashley gave me love." After biographies, historical fiction is probably my favorite genre. This book is very well written. There are many tender moments between Kat and Elizabeth, as would be expected of a 3 year old left with only her governess. At times, Elizabeth is allowed to be at court, tutored alongside her brother, Edward. Other times she and her older sister, Mary, are ordered to stay in country houses. The girls, along with their governesses, are completely at the mercy of the whims of their current stepmother. Throughout Elizabeth's tumultuous childhood, Kat is allowed to remain with her. 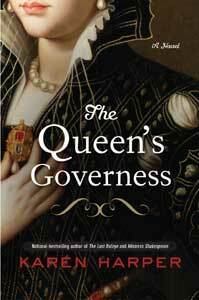 I am not well versed in the history of Elizabeth I and immensely enjoyed this book. Stopping by from Inspiration Monday - I am a major Tudor fan as well and interested in all things Anne & Elizabeth related. I will add this to my list thanks! Marci, I'm going to get this one from the library. thanks! Oh, I love Tudor fiction. This looks great! This sounds like a good book. Our book club meets here tomorrow and we're discussing 'The Third Secret" by Steve Berry. i've seen this book listed in catalogues I receive and will now add it to my reading list. Thanx! I too love historical fiction, and the time of the Tudors. I will have to find some time to read this and it's preceding series - they sound right up my alley. Thanks for sharing your thoughts! I'm completely fascinated by the synopsis! Thanks for sharing this at Booknificent Thursday! I really want to read it now.